Definition at line 32 of file network-monitor-impl-noop.hpp. Definition at line 36 of file network-monitor-impl-noop.hpp. 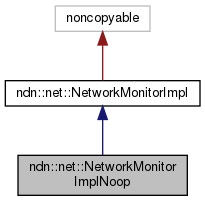 Definition at line 41 of file network-monitor-impl-noop.hpp. Definition at line 47 of file network-monitor-impl-noop.hpp. Definition at line 53 of file network-monitor-impl-noop.hpp.